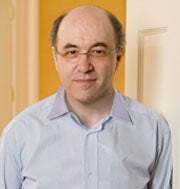 Stephen Wolfram believes he has created the ultimate natural search engine and it's coming in May 2009. Called Wolfram Alpha, the new search engine can understand a fact-based question and return a specific answer on its own. This is a significantly different approach from Google, which accepts keywords and then matches those words to millions of indexed documents. The difference is this: Google takes the words you type into the search box, matches it to similar words across the web and then spits out the results without ever understanding what any of the words mean. Wolfram, on the other hand, claims his search engine can understand what you're asking it and decide on the correct response without referring to the rest of the web. So how do you accomplish this? Well, you simply take all fact-based human knowledge and put it in a computer. Then you figure out a way for the computer to understand and use all that knowledge to come up with answers. After that's done you just create a way for human beings to interact with that computer using everyday language. As I said, simple. So far the only outsider to have seen and used Wolfram Alpha is Nova Spivack -- the creator of Twine, a semantic language bookmarking and sharing service -- who says that Wolfram Alpha "may be as important for the Web (and the world) as Google." Spivack says that Wolfram Alpha "is like plugging into a vast electronic brain" that can answer questions about "technology, geography, weather, cooking, business, travel, people, music, and more." Not only does this "brain" understand the question being posed to it, Wolfram and Spivack claim it will deliver the answers using natural language questions, such as "What was the average rainfall in Boston last year?" or "What is the 307th digit of Pi?" Wolfram also says you can use shorthand notation specific to various professions. Presumably that means Wolfram Alpha can compute scientific formulas that it hasn't seen before, music theory references, and other profession-specific uses of language. Wolfram Alpha does have its limitations though. Since its answers are based on its own software and storehouse of knowledge (instead of matching keywords), Wolfram Alpha can only answer a fact-based question that has a specific answer. These claims about the wonders of Wolfram Alpha by both Spivack and Wolfram seem a bit outlandish to me. First of all, we only have the word of two people that this thing actually works. Second, while many devices have stepped off the pages of science fiction and into the real world, the all-knowing supercomputer isn't one of them. Many people have tried to accomplish this, but no one has done it yet. Now Wolfram, a noted and sometimes controversial software engineer/theoretical physicist, has secretly been tinkering away with a small cadre of experts and claims he's done it. However, he's not ready to open Wolfram Alpha up to a demonstration to the media or computer science experts; instead, he's allowing access to only a few "select individuals." Whatever that means. However, it's not as though Wolfram is a stranger to the concepts behind Wolfram Alpha. After he earned a PhD in theoretical physics from CalTech in 1979 at the age of 20, Wolfram launched Mathematica in 1988. Mathematica is a renowned computational program used by scientists, engineers, and mathematicians the world over. The software recently became available in a home version that can be used for "solar system mapping, stock and investment analysis, [and] weather pattern analysis" among other things. After Mathematica, Wolfram published in 2002 a book called, "A New Kind of Science," which he claimed was a revolutionary new way to think about science and scientific experimentation based on computation. The book did not turn the scientific community upside down, as Wolfram may have believed it would, but combining his thoughts from the book and his knowledge of Mathematica, Wolfram came up with Wolfram Alpha. Since Wolfram Alpha is supposedly a storehouse of human knowledge, Wolfram says it will never be finished as human knowledge is always increasing and changing. Of course, the idea that Wolfram has created a computer that can, on its own, answer any fact-based question is so preposterous, so presumptuous and so absolutely ridiculous that I simply can't wait to try it out.